New members Linda Cartwright and Brad Monroe, along with re-elected board member Debbie Justeson, were sworn into office for the Grossmont-Cuyamaca Community College District Governing Board on Dec. 11. Cartwright was then unanimously selected to serve as board president for 2019, with Justeson serving as vice president and board member Elena Adams as clerk. Cartwright has been a public school teacher for more than 30 years, working as an elementary school teacher in the National School District. She has served as a mentor teacher, a Beginning Teacher Support and Assessment coach, and was elected president of the National City Elementary Teachers Association. She was honored with the California Teachers Association WHO Award. Monroe, a community college educator for 43 years, was founding chair of the Ornamental Horticulture program at Cuyamaca College. He developed the annual Spring Garden Festival, and helped bring the Water Conservation Garden to the college. He was named Horticulturist of the Year by the San Diego Horticulture Society in 2013 and the Irrigation Association’s Person of the Year in 2008. The Governing Board holds its meetings on the third Tuesday of each month, except in September and December, when they will be held on the second Tuesday. The meetings start at 6:30 p.m. following a closed session. 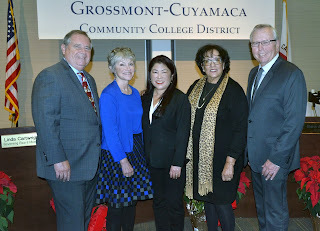 The board meets at Griffin Gate at Grossmont College in even-numbered months (February, April, June, August, October and December) and at the Cuyamaca College Student Center in alternate months.